Buy Your Tickets Now for NIAF’s New York Gala on April 9! Time’s running out! This year, NIAF’s New York Gala returns to Cipriani 42nd Street on April 9 at 6:30 p.m. Hosting the Gala is Joe Piscopo! 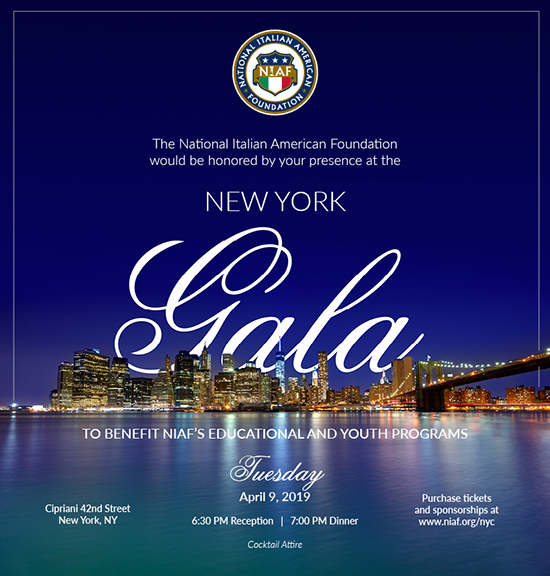 Gala proceeds benefit NIAF’s education and youth programs. Purchase your ticket today before they sell out at https://e.givesmart.com/events/c5w/. 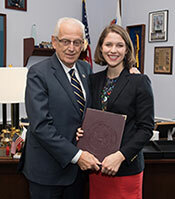 Open Today: Apply for the NIAF Congressional Fellowship! In September 2019, the Foundation will place five outstanding Italian American college students and recent graduates in the offices of members of the Italian American Congressional Delegation (IACD) to encourage and support the next generation of Italian American leadership. NIAF will award fellows with a stipend of $1,000 to aid with travel and living expenses while working in a Congressional office in Washington, D.C. Application opens April 1. The deadline is May 31, at 11:59 p.m. ET. For details, visit: https://bit.ly/2phN1xe. 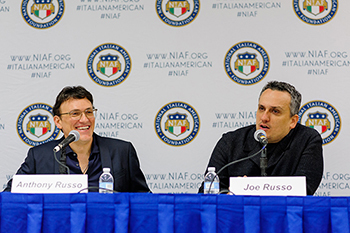 On April 1, NIAF and the Italian Sons and Daughters of America (ISDA) officially announced the 2019 grant selections for The Russo Brothers Italian American Film Forum. Spearheaded by directors Anthony and Joe Russo, the Film Forum is an initiative to fund films depicting and exploring the Italian American experience for the benefit of future generations. CLICK HERE to see who were this year’s grant recipients. Throughout the month of May, the John F. Kennedy Center for the Performing Arts, in conjunction with the National Symphony Orchestra and Washington National Opera, is proud to present Unexpected Italy, a celebration of Italy’s extraordinary artistic and cultural heritage. 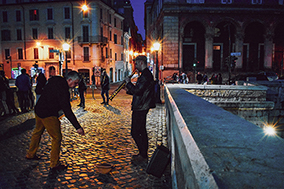 Unexpected Italy will present a variety of art forms, including two weeks of Italian-focused performances in the Kennedy Center in Washington, D.C., as well as a performance in New York’s Carnegie Hall. Here is the list of events at the Kennedy Center: Giacomo Puccini’s Tosca from May 11-25, Gioachino Rossini’s Stabat Mater from May 16-17, Mario Biondi on May 21, Simona Molinari on May 26, Doctor 3 on May 28, and Ludovico Einaudi on May 31, as well as four Millennium Stage performances which are free to the public. Gioachino Rossini’s Stabat Mater and Dante Symphony will be on May 19 at Carnegie Hall. 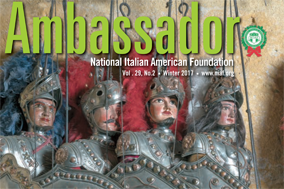 NIAF is a sponsor of Unexpected Italy and has contributed $10,000 toward making this series of performances possible. 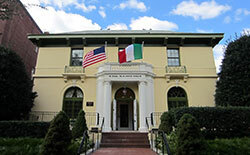 See the pdf for more information..
NIAF Museum on Italian Immigration is Open! The Museum recounts the hardships that Italian immigrants faced from enduring the journey across the Atlantic by ship and living in the United States, to their successes in the fields of music, entertainment, government, business, and the extraordinary achievements of Italian American women. Open to the public Monday — Thursday, 11 a.m. – 4 p.m., except for holidays; self-guided tours; admission is free. For more information, visit: https://bit.ly/2UgcUhE. Cinema Little Italy will screen Sicilian Ghost Story, with English subtitles, at the Firehouse Museum Theater in San Diego. April 6 at 7 p.m. For more information, visit: https://bit.ly/2HYSOlz. Pianist and Composer Curt Cacioppo will be performing with a quartet of singers and instrumentalists in Pennsylvania and New York to celebrate the bicentennial of Walt Whitman’s birth in the World premiere of Red Jacket/Yonnondio, an integrated setting of two poems by Walt Whitman about Native American concerns. The three concerts will proceed as follows: April 6 at 4 p.m. at the Academy of Vocal Arts, Philadelphia; April 7 at 3 p.m. at Haverford College, Pa.; and April 9 at 7 p.m. in New York City. For more information, visit: https://bit.ly/2WwD8Kn. The Seventh Annual VinDiego Wine and Food Festival is a wine tasting that will include a silent auction of items ranging from bottles of wine, to recreation packages, art and more! Includes more than 200 wines to taste and bites from San Diego’s best chefs. April 13 from 3 – 7 p.m. Buy your tickets today before they go up in price: https://bit.ly/2WpFn1V. 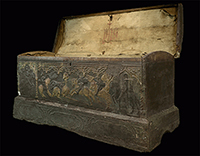 The National Organization of Italian American Women (NOIAW) will host a guided tour of the Jacopo Tintoretto exhibition at the National Gallery of Art in Washington, D.C., in celebration of the artist’s 500th birth anniversary. Tickets are free for NOIAW members; $5 for non-members. Reservations are required. April 27 from 6:30 – 7:30 p.m. RSVP here: https://conta.cc/2Ug8KWQ. The Getty Center in Los Angeles is hosting the exhibit Spectacular Mysteries: Renaissance Drawings Revealed. This exhibit will explore how drawings by Michelangelo, Titian and other Renaissance masters were created, the purposes they served, and what is known and unknown about the Renaissance drawings on display. Open until April 28. Free Admission. For more information, visit: https://bit.ly/2HJKzKK. The museum’s current exhibition is Claudio Parmiggiani: Dematerialization, featuring a selection of the Italian artist’s unconventional art, including 15 two- and three-dimensional works that address the passage of time, mortality, absence, memory and silence. On display until May 5. For details, visit: https://bit.ly/2Q17tgg. Famous Italian pianist and composer Ludovico Einaudi will be touring the United States this spring and summer. His first concert will be on May 31, in Washington D.C., as part of the John F. Kennedy Center of the Performing Arts’ Unexpected Italy series, sponsored by NIAF. His tour will proceed to Philadelphia, New York City, Chicago, Denver, San Francisco, San Diego, Los Angeles and will end in Seattle on June 18. Purchase tickets here: https://bit.ly/2V1q7Io. 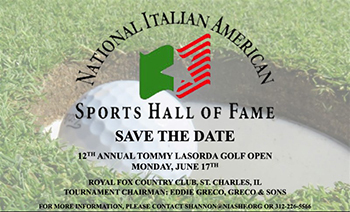 The 12th Annual Tommy Lasorda Golf Open will be hosted by the National Italian American Sports Hall of Fame on Monday, June 17, at the Royal Fox Country Club in St. Charles, Ill. For more information, please contact Shannon@niashf.org or call 312-226-5566. La Giara (The Water Jug) is a book and musical that will be performed at World Café Live in Philadelphia. The author, composer and playwright Patricia King Haddad based the story from her family’s emigration from Sicily to Philadelphia. La Giara’s song Isn’t it Love was awarded First Place by New York’s York Theatre Company for Best Love Song. April 13 at 8 p.m. 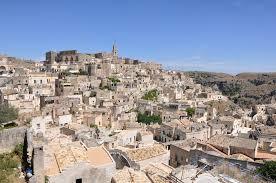 The Italian Heritage and Culture Committee of New York Inc. (IHCC-NY Inc.) announced that its members voted for this year’s annual theme to celebrate Matera, in Italy’s region of Basilicata, as the European Capital of Culture 2019. This coincides with the inaugural of the year-long celebration in Matera, that began in January with the participation of the President of the Republic of Italy Sergio Mattarella. For more information, email Nancy Indelicato at naindel@hotmail.com. The Italian Cultural Foundation at Casa Belvedere’s Culinary Classes offer recreational and educational culinary experiences on a year-round basis. Day-time and evening classes are held in Casa Belvedere’s state-of-the-art Cucina Colavita Kitchen and are available for adults and children. For more information on these and other Casa Belvedere programs, visit www.casa-belvedere.org or call 718-273-7660. Nancy Jo Polito’s Nobody Washes Me, I’m Italian! Auguri to NIAF Member and author Nancy Jo Polito for her first published work, Nobody Washes Me, I’m Italian! The book is about her Italian father and the Italian immigrant experience in the United States. It was inspired by her father’s four cassette tapes she found after his death in which he told his childhood stories, the journey to America, and the assimilation process. Available on Amazon: https://amzn.to/2FCmumP. Auguri to NIAF Member and author Norman Mathews for his newly published autobiography, The Wrong Side of the Room: A Life in Music. Mathews is a Sicilian American whose autobiography traces his life from his childhood in Illinois to his career as a dancer working with Barbra Streisand, Gene Kelly, and Dorothy Lamour, and as a composer and playwright of opera and musical theater, with performances by major concert artists and Tony-Award-winning performers. Available on Amazon: https://amzn.to/2FART90. Looking for professional help with building your application for Italian citizenship? Your Italian Passport is here to help! 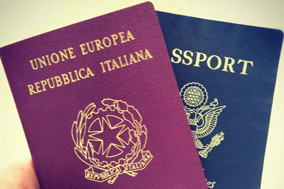 Your Italian Passport is a U.S.-based company offering comprehensive services for Italian Americans seeking to obtain Italian dual citizenship. Like so many things Italian, Your Italian Passport is a business of organic roots grown over time with care and committed to giving personalized attention to each and every client. Visit our website www.youritalianpassport.com and be on your way to living la dolce vita! As always, NIAF members receive a discount on all services offered. A new world awaits with Your Italian Passport! Contact us today! Say buongiorno in the eternal city with a cappuccino. Starting May 2, fly nonstop to Rome from the beating heart of the United States with our new flight Washington-Rome. Arrive in Rome refreshed and enjoy Italy’s favorite breakfast, a delicious cappuccino and hot croissant, before beginning your day visiting its famous sites. Or just take in the city’s mood where history and modern life mix by strolling down its cobblestone streets and its spacious piazzas. View our special offers! From the United States, Alitalia operates Boeing 777 and Airbus A330 aircraft configured with three travel classes: Magnfica, Premium Economy and Economy. Magnifica, our long-haul business cabin, offers award-winning business class seats in Poltrona Frau leather, fully lie-flat and equipped with massage function, award-winning dining and complimentary Wi-Fi connectivity up to 50MB. In Premium Economy, you will enjoy 40% more space than in Economy in the comfort and privacy of a dedicated cabin, Italian inspired dining experience, and complimentary Wi-Fi connectivity up to 10MB. Take a 360 degree virtual cabin tour on our A330! 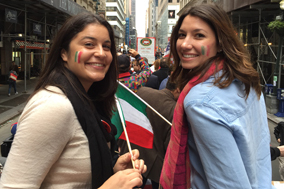 Want to be part of a larger Italian American community? With NIAF membership, you’ll be standing up for your family heritage and supporting future generations of Italian Americans. For more information about NIAF and its exciting benefits, visit: https://bit.ly/2TGTDBq. We’re creating an alumni database of past participants in NIAF’s Voyage of Discovery and NIAF’s Gift of Discovery programs and we need your help! Did you or someone you know participate? If so, let us know. Please email your name, Voyage of Discovery year, and any other information you’d like to share about your experience to voyageofdiscovery@niaf.org. Heads up, NIAF members! Check out all money-saving discounts, exclusive deals and membership benefits that NIAF Corporate Sponsors offer through your NIAF Membership Portal. Sign in with your NIAF password at: https://bit.ly/2YufT5j. Shop at AmazonSmile and Support NIAF! Here’s your opportunity to donate to NIAF without costing you a cent! Support the work of NIAF when making purchases on Amazon.com by going to http://smile.amazon.com/ch/52-1071723 and selecting the National Italian American Foundation as your charity of choice. The AmazonSmile Foundation will donate 0.5 percent of the purchase price from your eligible AmazonSmile purchases to NIAF. AmazonSmile offers the same selection and low prices as Amazon, and customers can still use their Amazon account. The only difference is that, at no extra cost, you are donating to a great cause! 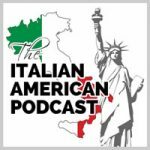 The National Italian American Foundation is proud to be the official sponsor of The Italian American Podcast, the first podcast dedicated to helping Italian Americans learn about and celebrate their heritage. Hosts Anthony Fasano and Dolores Alfieri interview celebrities and nonnas alike, bringing you an authentic Italian American experience. Listen to the Podcast’s latest episodes here: http://ow.ly/qZRI301LHRm. For monthly cable-TV programming for the Italian American community, tune in to Italics, the Italian American TV magazine, produced by The John D. Calandra Italian American Institute at Queens College in New York and hosted by Anthony J. Tamburri, dean of The Calandra Institute. Check your local New York and New York State cable-TV listings for Italics, or find it on CUNY-TV website, and on-demand on the YouTube channel and Facebook. Everybody Loves Italian! On the Radio! Join hosts Frank Granieri and Dominic Mevoli to celebrate the everyday Italian American family and experience, plus interviews with personalities, stories, recipes and more! Sundays 6 a.m. and 5 p.m., on WWDB 860 AM Philadelphia; and streaming worldwide! Find them on Facebook. 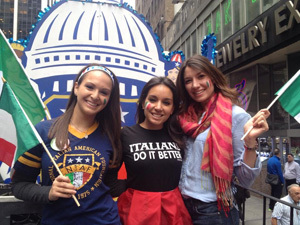 For more information, visit: www.everybodylovesitalian.us. sponsoring an upcoming edition of NIAF’s monthly e-Newsletter!